Brainstorming, machine learning, and humor follow similar paths to divergent results. In this talk I explore how such similar paths can lead to such dissimilar outcomes and what we can infer about the nature of ideas from them. Ideas are built by following a logical progression of understanding about the nature of things. Humor is a twist in the tail of that progression. 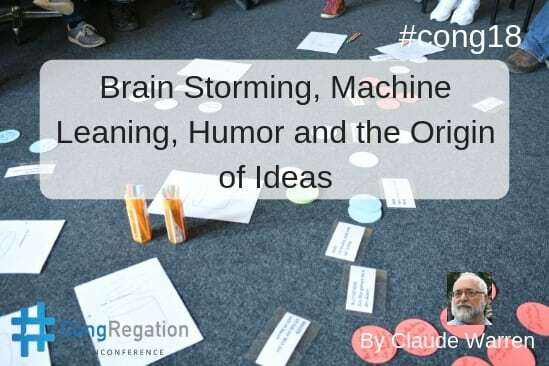 Brainstorming is equivalent to taking the humor result and finding a way back to the reasonable. Machine learning is the artificial development of the logical progression. I am Claude Warren the lead innovator at Wipro Galway. I have a deep interest in innovation, ideas and where they come from and how to promote their development. I first presented at Congregation last year when I spoke about the environment that is necessary to promote innovation. Here I take that presentation further and explore the nexus from which ideas spring. You can contact Claude by eMail. Software reviews thousands of points of data, analyzing each and understanding how they fit together by understanding when they occur at togeter at a nexus. The program moves step by step through the possibilities picking out the most likely path. Machine learning, discovering and following paths. All three evolve from the ability to create and follow a logical progression. The comedian takes the logical progression and at the comedic break brings the listener up short and exposes a foible in the assumptions of the progression. The sudden shift that is still logically achievable is the base of humor. The mad scientists brainstorming take the logical progression beyond reasonable and then bring it back again with a shift in the assumptions of the progression. Suddenly there is insight into the problem. Software simply attempts to deduce the expected outcome, but could it be “taught” to make the unexpected leap to a different interpretation of the logical progression? If so could that be humor, or perhaps more frighteningly, could that be like the result of a brainstorm an autonomous idea?